Resi (1960) is an experienced nurse. 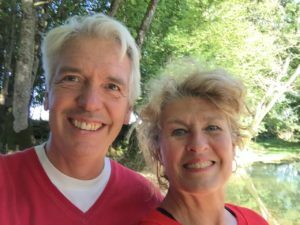 After a career in the Academic Hospital Maastricht and practicing as a teacher she moved to Switzerland to be with her husband. Together with Tim, she has completed two renovation projects, one in Switzerland and one in Maastricht. Resi can put her sense for warm and cosy interior design talents and experience in coordinating reservations and the administration into Rennepont. Plus she loves to cook! Tim (1957) is the husband of Resi. He lived in Switzerland for 27 years and therefor is fluent in French. He has spent the last 10 years in the event industry leading some major projects. He is responsible for financial planning, overall coordination and conducts negotiations. Together we form HERT, the real estate company that manages the domain. Beautiful place with hard werking people. An absolute fantastic place! It's one of few places that deserve 5*. Hosts (Tim and Resi) are amazingly friendly and easy going. Found this place by mistake, best mistake in our travelling through France! Resi and Tim, a Dutch couple hold this domaine. Multilingual, multinational, multicultural - a real pleasure. The Irish cook serves stew and we drink local wines. Highly recommended! Wat een heerlijke plek om te vertoeven! Resi en Tim zijn werkelijk fantastische mensen die er alles aan doen om je verblijf zo comfortabel mogelijk te maken. Van de eerste ontmoeting, de heerlijke maaltijden, de perfecte kamers, tot aan het uitzwaaien: Fantastisch!!! Prachtige omgeving en mooi complex. Vriendelijke ontvangst. Goed ontbijt. Ook mogelijkheid voor table d'hôte. Gewoon goed.